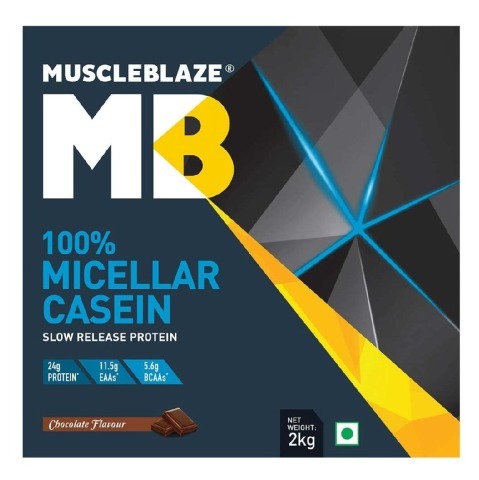 MuscleBlaze 100% Micellar Casein 4.4 lb Chocolate contains milk-derived micellar caseins, which is the purest form of casein protein. A result of microfiltration, micellar casein is the most biologically intact form of casein protein and is untreated with heat or acid. MuscleBlaze Micellar Casein is a better acting protein source and helps to prevent overnight and in between meals, muscle breakdown. It's all micellar protein and very little else. 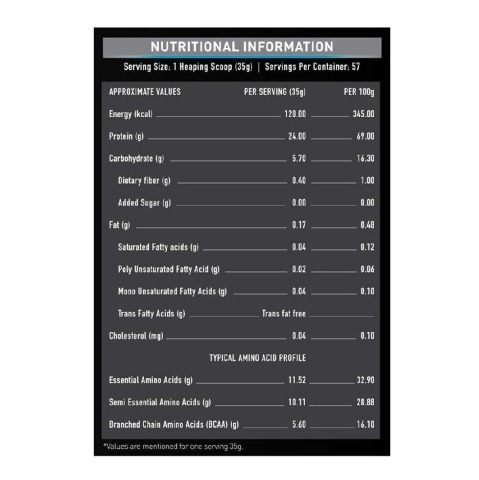 In each 35g serve, you get 24g protein, less than 1g of fat, 5.7g carbohydrates, without any sugar content to keep unwanted fat away. 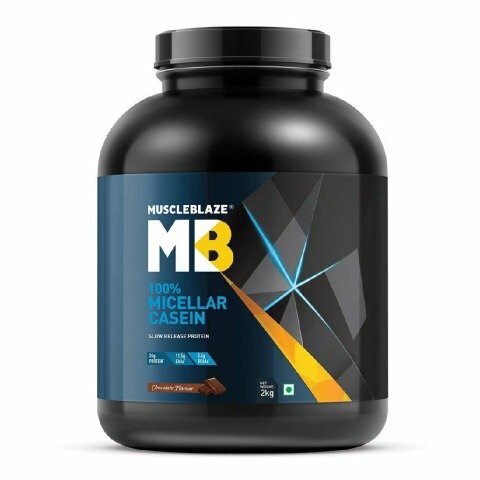 MuscleBlaze Casein Protein 4.4 lb Chocolate also contains 5.6g of BCAAs and 11.5g of EAAs, which helps with the muscle development and recovery. MuscleBlaze 100% Micellar Casein 4.4 lb is a superior blend of microfiltered whey protein isolate and ultrafiltered whey protein concentrate. It is also formulated with amino acids, which helps to enhance the flow of blood into your muscles and strengthen them. The enhanced flow of blood to the muscles helps to ensure that your muscles get essential nutrients as per the requirement. 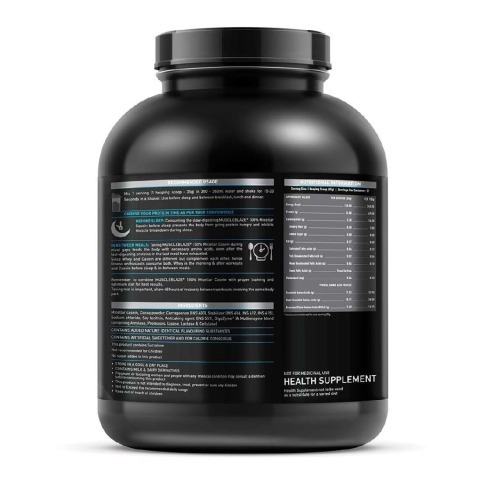 It contains pure micellar casein protein, which stays in the system for a longer duration of time and performs its functions of building and maintaining lean muscles. It helps to boost your immune system and protect you from harmful infections. 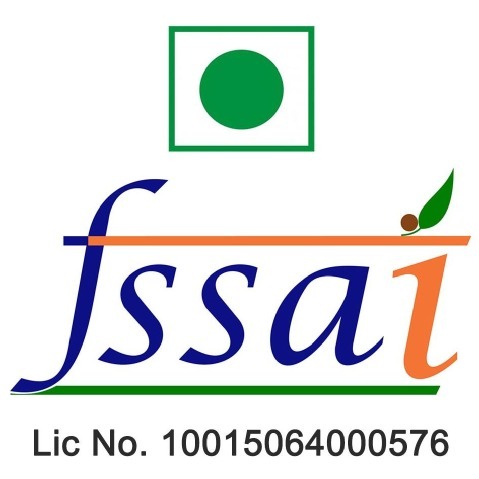 Micellar Casein, Cocoa Powder, Carrageenan (INS 407), Gum Acacia (INS 414), Salt, Guar Gum (INS 412), Soy Lecithin Powder (INS 322), Acesulfame Potassium (INS 950), Sucralose (INS 955), Xanthan Gum (INS 415) and Digezyme. Mix 1 serving (1 heaping scoop) with 1 cup (10-12 oz) of cold water or milk in a glass or shaker cup. Use before sleep and between breakfast, lunch and dinner. Before Sleep: Consuming the slow-digesting MuscleBlaze 100% Micellar Casein 4.4 lb Chocolate before sleep prevents the body from going protein hungry and inhibits muscle breakdown during sleep. In between Meals: Consuming this during meal gaps feeds the body with necessary amino acids, even after the fast-digesting proteins in the last meal have exhausted. Combine MuscleBlaze Micellar Casein with proper training and optimum diet for best results. 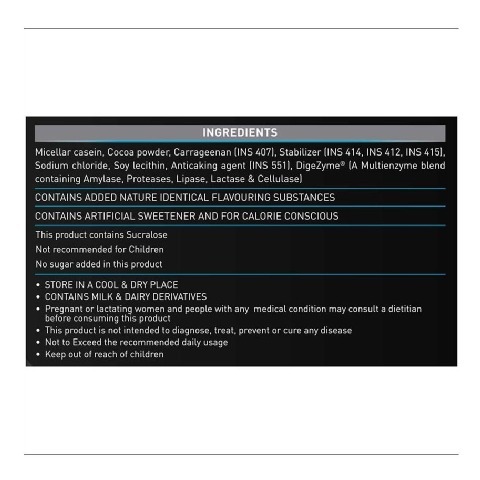 What is MuscleBlaze 100% Micellar Casein? MuscleBlaze 100% Micellar Casein contains milk-derived micellar caseins, the purest form of casein protein. A result of microfiltration, micellar casein is the most biologically intact form of casein protein and is untreated with heat or acid. 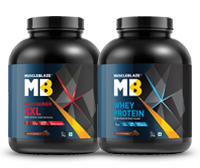 How MuscleBlaze 100% Micellar Casein promotes muscle building? The sustained amino acid release in MuscleBlaze 100% Micellar Casein feeds muscle for up to 7 hours and prevents muscle breakdown. During prolonged meal-gaps and in the night, your body breaks down muscle fibers to fuel metabolic processes. MuscleBlaze 100% Micellar Casein forms a gel in the stomach and slowly trickles down amino acids to the blood stream. 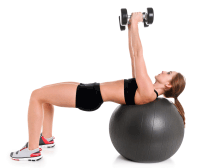 The sustained release of amino acids feeds muscle fibers up to 7 hours. This prevents muscle breakdown and helps you maximize total muscle gain. How whey and casein differ from each other? An outcome of cheese making process both casein and whey are milk-based proteins, but with different effects on muscle building process. When citric acid is added to milk, while preparing cheese, it separates in two protein components: whey and casein. The watery remnant has whey proteins and cheesy, clump like milk-residue is casein. The protein content in milk is 80 percent casein and 20 percent whey. Who should use MuscleBlaze 100% Micellar Casein? Anyone who is physically active/ trains regularly stands to benefit with MuscleBlaze 100% Micellar Casein. In body builders, micellar casein because of its long-lasting stay works as an excellent nighttime and in-between meal protein to prevent muscle breakdown & maximize lean muscle gain. When to supplement MuscleBlaze 100% Micellar Casein? The best time to supplement MuscleBlaze 100% Micellar Casein is before sleep and in-between meals to keep the body in a positive nitrogen balance, even after the fast digesting proteins from the last meal have exhausted. Mix 1 serving (1 heaping scoop) with 1 cup (10 to 12 oz.) of cold water or milk in a glass or shaker cup. Use before sleep and between breakfast, lunch and dinner. 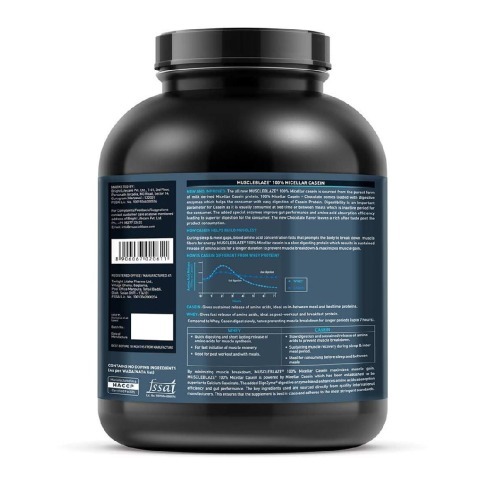 Before Sleep - Consuming the slow-digesting MuscleBlazeTM 100% Micellar Casein before sleep prevents the body from going protein hungry and inhibits muscle breakdown during sleep. In between Meals - Taking MuscleBlazeTM 100% Micellar Casein during meal gaps feeds the body with necessary amino acids, even after the fastdigesting proteins in the last meal have exhausted. Since Whey and Casein are different but complement each other, hence fitness enthusiasts consume both, Whey in the morning and after workouts and Casein before sleep & in-between meals. Remember to combine MuscleBlazeTM 100% Micellar Casein with proper training and optimum diet for best results. Taking rest is important, allow 48 hours of recovery between workouts involving the same body part.